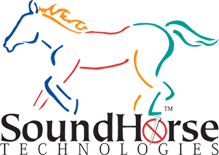 SOUND HORSE Glue-On Horseshoes are farrier designed, university patented, clinically tested and competitively proven. 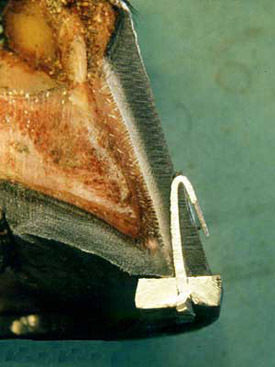 Damaged Hooves can be successfully shod without nails. Used regularly & successfully used by the most competitive of horses in world class events in every discipline. Horses can be kept in full work while they grow healthy hooves with the use of Sound Horse’s Sigafoos Series glue-on horseshoes. Many owners use the Series I Shoe prophylactically to avoid problems caused by nails. The built-in quarter inch polyurethane rim pad on the Sound Horse glue-on horseshoe is unmatched in shock reduction capability. The Sigafoos Series™ horseshoes are the only glue-on horseshoes that are clinically proven for treating most "sore feet" problems. The adhesive bonded, fabric cuff system has over 14 years of proven success in getting sore-footed horses back to work fast. These shoes incorporate a 1/4-inch thick, concaved rim pad to reduce concussive shock effects on the hoof and lower leg. 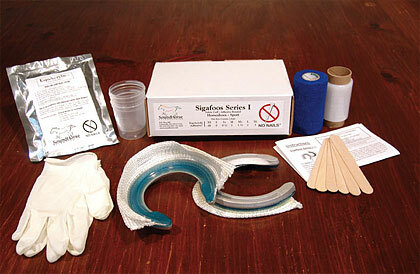 Can be used on horses with thin, cracked, broken, brittle or shelly hooves and those exhibiting a sensitivity to nails. Other than conventional farrier tools, no special equipment is required. Everything needed to apply the Sigafoos Series™ glue-on horseshoes come conveniently packaged in the Sound Horse Technologies™ shoe kit. Set includes: 1 pair shoes, 2 pair rubber gloves, 1 roll of CoFlex, 2 mix cups, 4 wooden blades, 1 mini-roll of stretch wrap, 2 foil pouches of 90 gram 3 oz bi-component packs of EquAcrylic adhesive and detailed instructions. 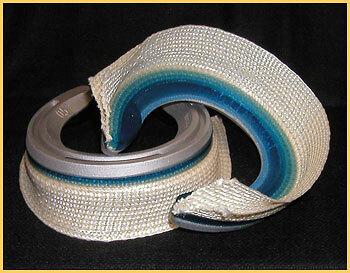 *You can use your own adhesive, such as Equilox, as long as it is an Acrylic and NOT a Uretheane. 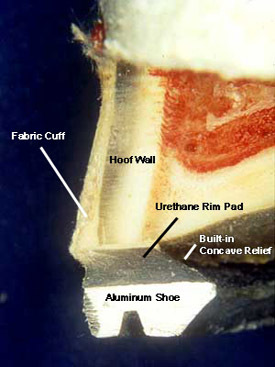 The patented cuff attachment system uses acrylic adhesives to bond to the entire hoof wall safely generating twice the holding strength of nails. The strongest attachment possible – particularly with cracked, thin, broken, brittle and shelly feet – is achieved with no glue on the bottom of the hoof and no risk to hoof integrity. This is the best method to overcome your horse's sensitivity to nails.